Remember to bookmark this page new Ninja games added every day/week. Spring Ninja 2 Spring Ninja is coming back, let’s help him avoiding all obstacles, defeat all enemy, and complete the new adventure! Good luck! Ninja Cannon Retaliation The ninja cannon is back, with 32 new levels of ninja ring, the evil twin ninja has set out to avenge his brother is this physics puzzler. Ninja vs Zombies Shoot your ninja with mouse to hit evil zombies, and complete 20 levels with puzzle elements. Nasty Ninja The Dragon Killer has appeared on the eath. Only Takeshi the nasty ninja can defeat him and save the world. Ninja Cat and Zombie Dinosaurs Help the cat do math! She is trying to learn how to add, subtract, multiply, and divide. Can you help get the answers right? Rico Ninja Help Rico get rid of all the zombies. Advanced Ninja Advanced Ninja - Cool ninja game, grapple through the levels to proceed. Chick Ninja Chick Ninja jump edition. Let’s look at who can jump high!!! Shadow of the Ninja 2 The ninja is back! Sneak past enemies as you work to stealthily rescue hostages whilst collecting gemstones along the way. Ninja Miner Use your supernaturally quick ninja skills to hunt down precious gems. Ninja - Sliding Puzzle Click and slide the tiles to set them in correct position and see the image of the great fighter Ninja. Have Fun! Ninja Power Jump Ninja has to climb his way home. On the way collect the yin-yang to earn points. Avoid shurikens that are thrown on the way. Ninjas vs Zombie Throw Chinese stars at the zombies as you try and take them all out. BoxNinja Slice as many boxes as possible but dont hit the bombs! To Slice hold left mouse button down while moving the cursor through the box. Ninja Jump It is a fun jumping game. You can control ninja to move either left or right, but be careful with the obstacles! Ninja Turtle Help the ninja turtle eliminate all the enemies to pass the levels. There are many skill for you to choose. Good luck! Run Ninja Run You are trying to escape your assailants. Jump, slide and attack at the right moment. Your skills will be tested. Ninja Turtle Bike The Ninja's are back but this time on a motorbike. Ride through the sewers and try to reach the end. Ninja Super Ride Ride the motorbike along the challenging road. Bunny Fights Action filled fighting game through the platforms. Ninja Assay You've trained your whole life to become a ninja, Today we assay you. Pass all the tests and become a Master! Ben 10 Ninja Spirit Slice and dice ninjas as Ben 10. Flip switches and keep your health up as you move to the right. Ninja Spirit Show your ninja spirit ! 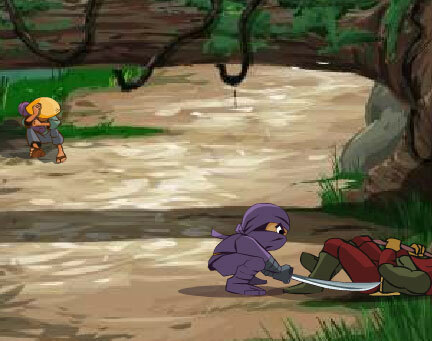 Fight evil ninjas in this ancient adventure! Nibasho Use Ninja babies to shoot robot schoolgirls. Ben 10 Ninja Ben 10 Ninja fighter game for kids. Try to be real ninja in this game. Ben 10 is awesome in this flash game. Ninja Vs Alien Explode aliens with a karate chop, jump up walls, and avoid lasers. Gets hard fast. Ninja Assassin 1 The little ninja hero comes and kills. Visible III What you may not see can certainly still kill you. The grand finale of the series! Death To Ninja Shoot the Ninja before they come in front of you. Teenage Mutant Ninja Turtles Double Damage Help the ninja turtles defeat shredder and the foot clan and rescue their friend april in this amazing game ! Final Ninja Click and hold to shoot out a rope to swing from and climb up. Mel The Midget Ninja Try to hit the fly with your sword! Ninja Turtles Shoot Out shoot the bad guys ! Ninja Turtles Puzzle Madness Fix the pieces exactly on the picture frame. Ninja Training A ninja must be nimble on his feet...his life depends on it.